Too often, students view history as a static entity, the result of inexorable, autonomous forces coming to rest at foregone conclusions. But as Portland educator Linda Christensen writes, social justice education demands that we help students understand that “history is not inevitable…there are spaces where it can bend, change, and become more just.”* When students apply a social justice lens to history, they discover the organic nature of change. This leads students to thoughtfully interpret and challenge history-making events happening all around them. In these lessons, students will delve into a “hidden history” of Portland through the essay “The Farmers of Tanner Creek,” and use it as an entry point for social critique and the exploration of past and present realities of immigration, displacement, gentrification, race, and the American Dream. *Christensen, Linda. Teaching for Joy and Justice: Re-Imagining the Language Arts Classroom. Rethinking Schools, Ltd., 2009. Use textual evidence to analyze immigrant experiences. Demonstrate their reading proficiency through a reading assessment or work sample. Explore issues of immigration, urban growth, displacement, gentrification, race, place, land, and the American Dream, while demonstrating their ELA and history/social studies skills through discussion and/or writing. What are some of the consequences of economic and urban growth, and who is responsible for these consequences? Who benefits and who suffers when places change and grow, and why? Why is it important to know the history of where we live, and how does this history shape the ways we live in the present? What are the obstacles and opportunities that immigrants experience, and how can we best address these obstacles to create more equal opportunities for all? What is the American Dream, and how has it evolved from the past to the present? Who has access to it, who doesn’t, and why? Review all resources and decide which components you will include and how many lessons to allot for this curriculum. (Note: Almost every component can be used as a stand-alone piece or combined with other components.) If you choose to conduct a Socratic Seminar, decide which extension materials or other outside materials you will use. Read and take notes on “The Farmers of Tanner Creek” essay. Preview and prepare the Chinese immigration introduction mini-lecture and PowerPoint. Print out the notes for each slide and review them before lecturing. You may choose to include only some of the notes in your lecture. Preview and prepare optional extensions. Model and instruct students to use the AVID® Marking the Text: Social Studies strategy as they read the article. While reading, circle key vocabulary, dates, names, historical events, and important numbers/statistics. After reading, go back and re-read sections, underlining evidence, facts, descriptions, and cause-and-effect relationships. While reading, pause at various places and model the think-aloud strategy to demonstrate comprehension/summarization of the text. Model and instruct students to use the Learn-Read-Discuss strategy. Present brief lecture and PowerPoint on Chinese immigrants while students take Cornell or other structured notes. Students read article (using teacher’s designated strategies). Students engage in small- or large-group discussion, synthesizing information from the lecture and article. You may choose to give advanced readers the SOAPS Text Analysis handout for tracking the author’s argument and purpose during their reading. Students’ observations using this strategy can be incorporated into later lesson steps, such as discussion and writing responses. Tell students that you will be presenting some background information to help them better understand the essay they will read (Listen-Read-Discuss strategy). Ask them to prepare materials to take notes in whatever style you choose (Cornell, outlining, charting, etc.). Pre-teach any note-taking strategies as necessary. Pause and give students time to answer the warm-up question at the beginning of the presentation. You may choose to have them conduct a think-pair-share before moving into the lecture. Pause and give students time to answer the post-lecture questions. You may choose to have them conduct a think-pair-share or closing discussion before moving on to further lesson steps. Frontload vocabulary and concepts from the essay prior to reading. Provide definitions or ask students to look up and record definitions. As an alternative, delay adding definitions until after reading, and ask students to use context to determine preliminary definitions as they read. Ask students to identify and circle vocabulary words in the essay as they read. After reading, review and clarify vocabulary words, and ask students to write down the sentence from the essay that uses each word. After reviewing the reading strategy, read the essay with students or ask them to read silently. If reading aloud, pause to review and synthesize information at various points before proceeding, using think-alouds or other strategies. Consider using additional maps of Goose Hollow before, during, and after reading to facilitate comprehension of the concepts. Explain to students that they will write a poem based on information from the essay. Review the instructions on the poem handout. Optional: Read and discuss the sample poem before giving students time to brainstorm and write (see scaffolded version of assignment). Help students edit and revise their poems individually or with partners or small groups. Guide them to focus on cutting or changing language in order to create the greatest impact. Ask them to think about the tone of their poems and what feelings they want to communicate to their audience, along with the feelings they want their audience to experience. Host a read-around session, in which students can choose to read their poems in their entirety or only a powerful line or stanza. They can give each other either written or verbal feedback, including only positive comments or one positive comment and one constructive criticism. Decide whether you will use a spoken or written format for this assessment. Review the instructions on the discussion/writing assignment handout, and give students time to review and prepare notes on the essay and any additional texts you might assign or ask them to research. For a written response, share what scoring guide you will use and give students additional instructions on response length and format. Set up instructional time to include each step of the writing process, including publishing and sharing if you choose, and any additional scaffolds and writing strategies. For discussion/Socratic Seminar, share the discussion rubric and give students additional instructions on discussion expectations and format. Set up instructional time to include discussion preparation, the discussion itself, and de-briefing after the discussion. You may want to have students turn in their notes for a writing portion of the overall discussion grade. Prince, Tracy J. Portland’s Goose Hollow. Arcadia Publishing, 2011. Wong, Marie Rose. 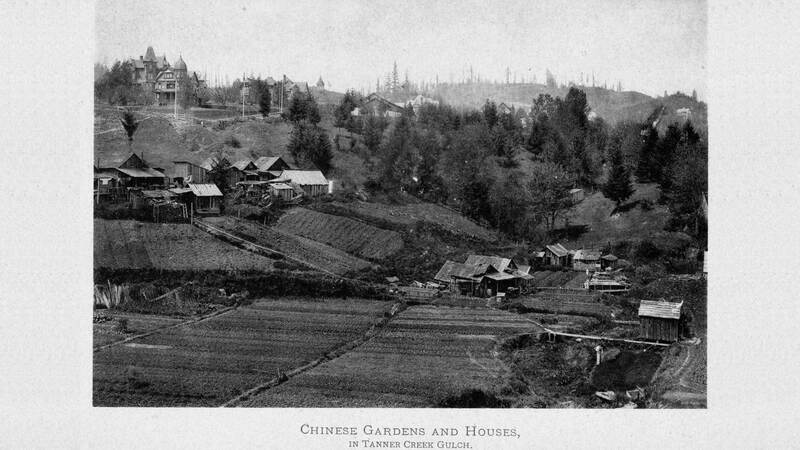 Sweet Cakes, Long Journey: The Chinatowns of Portland, Oregon. University of Washington Press, 2004. An Oregon Canyon: What’s in a Name? In these lessons, students will view and study the film “An Oregon Canyon” and use it as an entry point for social critique and the exploration of past and present realities of race, land, and place. In these lessons, students will read and study the essay “Becoming Asian” by Scot Nakagawa and use it as an entry point for social critique and the exploration of past and present realities of identity, immigration, race, and power. In these lessons, students will read and study the essay “Family Ties,” using it as an entry point for social critique and the exploration of past and present realities of race, land, place, immigration, civil rights, laws, and legislation. In these lessons, students will read and study the essay “Full Circle” and the short film “A Return Passage” and use them as entry points for social critique and the exploration of past and present realities of civil rights, media and journalism, power, justice, and refugees. In these lessons, students will read and study the essay “Good Hair,” and use it as an entry point for social critique and the exploration of past and present realities of identity, family, gender, race, and appearance. In these lessons, students will read and study the essay “Making Men” and use it as an entry point for social critique and the exploration of past and present realities of sexuality, violence, family, gender, power, culture, and values. In these lessons, students will read and study the essay “Making Peace with Chaos,” which contrasts stereotypes about refugees to the realities of refugees’ lives in Portland. Students will use the essay as an entry point for social critique and the exploration of past and present realities of refugees, displacement, immigration, belonging, and the American Dream. In these lessons, students will read and study the essay “The Original Laws” and use it as an entry point for social critique and the exploration of past and present realities of environment, ethics, natural resources, culture, and values. In these lessons, students will read and study the essay “The Air I Breathe” and use it as an entry point for social critique and the exploration of past and present realities of belonging, gentrification, displacement, power, race, and place. In these lessons, students will view and study the film “The Numbers” and use it as an entry point for social critique and the exploration of past and present realities of civic life, gentrification, displacement, land, and place. In these lessons, students will listen to interviews and view photographs from the story “To Live More Free,” using the content as an entry point for social critique and the exploration of past and present realities of race, land, place, immigration, civil rights, laws, and legislation. In these lessons, students will read and study the essay “Uncovered” and use it as an entry point for social critique and the exploration of past and present realities of social identity, immigration, health, family, equity, and civil rights. In these lessons, students will read and study the essay “What They Carried,” and use it as an entry point for social critique and the exploration of past and present realities of immigration, belonging, family, and refugees. In these lessons, students will delve into a “hidden history” of Oregon through the essay “Within Makeshift Walls,” and use it as an entry point for social critique and the exploration of past and present realities of laws and legislation, place, power, race, public policy, civil rights, immigration, and displacement. In these lessons, students will read and study the essay “Your Cultural Attire” and use it as an entry point for social critique and the exploration of past and present realities of belonging, culture, identity, and power. we're doing around the state. © 2019 Oregon Humanities. All Rights Reserved.